Star Trek: Asterisk "Ménage à Troi"
Riker, Deanna and Lwaxana are taken by a Ferengi and have to outwit him in order to escape. Which shouldn't be too hard. So, there's a trade agreements conference on Betazed and Picard has opened up the Enterprise for the closing ceremonies which includes letting Ferengi on board. That was the first mistake. During the festivities, Riker beats one Ferengi at a game of 3-D chess, Lwaxana tries to convince Deanna to find a man and settle down, another Ferengi tries to hit on Lwaxana, and Lwaxana tries to hit on Picard. All the while, Algolian ceremonial rhythms are playing in the background to the delight and annoyance of the entire party. At the end of the conference, the Enterprise is charged to check out a nebula, but Deanna and Riker take some shore leave. 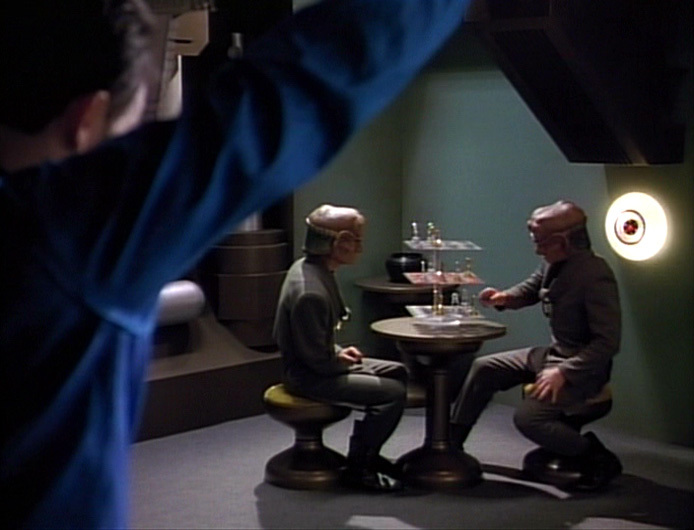 While they enjoy a walk on Betazed, they run into Lwaxana, and that's when they're captured by the Ferengi. DaiMon Tog is the Ferengi that hit on Lwaxana earlier. He has a romantic interest in her, but he also wants her to help with his business ventures by reading his clients' minds. When he finds Lwaxana enjoying a picnic with Riker and Deanna, he has all three of them beamed up to his ship and knocked out in the brig. When they wake up, Lwaxana and Deanna are beamed in front of him completely naked, as is Ferengi custom. He explains that Riker and Deanna are there to assure that Lwaxana will also stay. Little does he know that Riker is already at work devising an exit strategy. And, really, how stupid does he have to be to capture two Starfleet officers just to keep one of their mothers? I wouldn't make that move if I were you. Begrudgingly, Lwaxana agrees to entertain DaiMon Tog and returns Deanna to the brig with Riker who's trying to play chess with the same Ferengi he beat back on the Enterprise. Speaking of the Enterprise, while they're checking out this nebula, their communications are affected, so when they come out of it, they immediately get the message from Betazed that Riker, Deanna and Lwaxana are missing. Meanwhile, Wesley has passed a written exam to get into the Academy, but he's feeling nervous about going because he realizes he may not be assigned back to the Enterprise. When they get back to Betazed, though, he's kept pretty busy scanning for Ferengi signals, and the USS Bradberry is waiting to bring him back to Earth. On the Ferengi ship, Riker successfully charms his way out of the brig and knocks out the Ferengi playing chess. 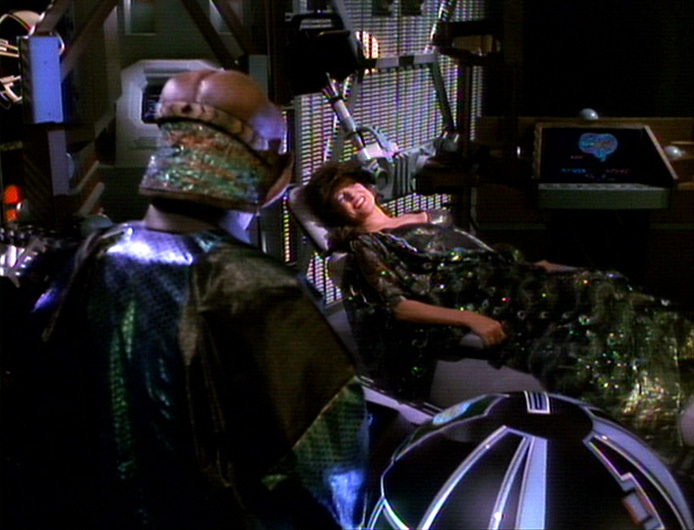 He and Deanna now have access to a control panel, but they need DaiMon Tog's access code, so Deanna contacts Lwaxana telepathically to get it, and Lwaxana seduces Tog to get the information. The Ferengi doctor, however, suspects her treachery and demands to be able to scan her brain so he can copy her telepathic abilities and sell it. The process could kill her, but he eventually talks Tog into letting him do it. At the control panel, Riker has done what he can to send out a signal. Meanwhile, the USS Bradberry can't wait any longer to pick up Wesley. After listening to a few more signals, Wesley goes to the transporter room, but while on the pad he has an epiphany and runs back to the bridge, missing his rendezvous. He discovered that one of the noises in the signal was an Algolian ceremonial rhythm, no doubt sent out by Riker to mimic background warp signatures, so they follow that signal. As the Enterprise catches up to the Ferengi ship, Riker and Deanna make their way to Lwaxana and help her escape the doctor, but they're caught by DaiMon Tog. Lwaxana reluctantly agrees to be with Tog if he will send Deanna and Riker back to the Enterprise. When the Enterprise arrives, they Riker and Deanna are immediately beamed back, but Picard doesn't want to leave a job two-thirds done. He hails the Ferengi ship and tries to get Lwaxana back. 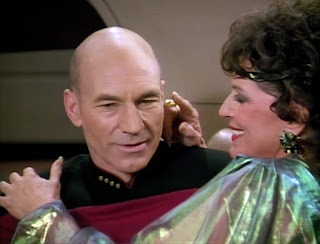 But Lwaxana insists that she is no longer Picards and she has a new lover now. Deanna cuts the audio and tells Picard she knows what her mother is doing. Picard has to fight for her. So Picard dramatically implores for her to be returned and she implies that he has killed all her past lovers. With that threat, Tog beams Lwaxana back to the Enterprise without a fight. And Lwaxana "thanks" her favorite captain. On the captain's chair? Okay. Meanwhile, for the third time in a row, Wesley has been unable to get into the academy. But Picard calls him to the ready room and tells him that he sees Wesley as "acting ensign" in title only. He, therefore, gives Wesley the field commission of full-fledged ensign with all the rights and privileges thereto. Wesley puts on the red shirt and as he walks onto the bridge for the first time as an ensign, Picard orders him to take them out for their rendezvous with the USS Zapata. This is a rather humorous episode, but it's always nice to see the eccentric Lwaxana Troi and her unrequited affections for Picard. As fun as it is, however, the reason I would put this on an essentials list would be for Wesley's storyline, brief though it may be. He's finally an ensign, and we know he's been working hard for that. Maybe one day we can see him actually grow to be a man with a beard and an attractive wife.